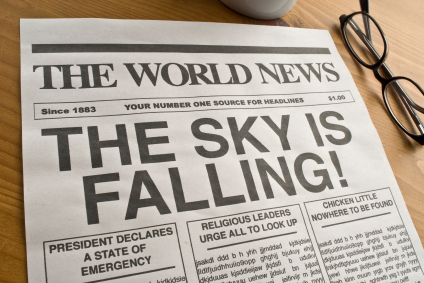 Contrary to Henny Penny, The Sky Is Not Falling! You may have heard Henny Penny over the past 2-4 years. Her standard line, “The Sky Is Falling” echoed across the country. However, You may have heard me suggested over the last few months that now is a good time to put your home on the market. Listen to me. It’s not hype. We’ve done the research. The data is clear. There may have been no better time to get active in this market than right now! There is no need to swim against the current right now. The water is warm, swim with it. A statistical analysis of January Metrolist data shows that a home seller had almost double the chance of selling a home in January of this year than in January 2011. The reason is an unusually low supply of unsold homes on the market, combined with a pickup in demand. In January, the number of unsold homes in the Denver area plunged by 41.6 percent from January 2011. That represents a record year-over-year percentage drop. At the end of January, there were only 10,443 unsold homes on the market. Of those, the vast majority – some 8,346 were single-family detached homes – while 2,087 were condominiums. The last January when there were fewer homes on the market was in 2001, when the market was much smaller. While headlines blared news of the decline in the number of houses on the market, one important metric has been largely overlooked – the weekly sales rate. The weekly sales rate compares the number of contracts written on homes to the inventory of unsold homes, providing one of the most important leading indicators of the direction of the housing market. The weekly sales rate in January 2012 was 7.71 percent compared with 4.06 percent in January 2011. Digging even deeper, last January’s sales rate was the briskest since May 2000, when it stood at 8.75 percent. January’s weekly sales rate was 12th highest since 1990. It is also the first time since 2000 that the weekly sales rate has been this high. Perhaps most impressively, it is also the first time that the rate has been that high in a January. The highest sales ever was in April 1999 when it stood at 10.21 percent. Since the sales rate is a function of two variables – supply and contracts – such a high rate could be an anomaly due to the extraordinary low inventory and could change quickly. That could mean that home sellers have a very short window of opportunity to take advantage of the situation. From a seller’s perspective, there is a trifecta of welcome news – not much competition from other homes, historically low interest rates, and a growing sense of urgency from buyers, who realize that the first two factors won’t exist forever. Foreclosures drop by 25 percent in Colorado, a sign that the worst might be over.